Prof. R. M. Santilli, President of The Institute for Basic Research, Florida, and author of the only available Newtonian representation of neutral antimatter asteroids, has been interviewed by a group of French scientists on the danger for Earth to be hit again by antimatter asteroids as it was the case for the 1908 Tunguska explosion in Siberia which was the equivalent of one thousand Hiroshima atomic bombs (http://www.i-b-r.org/Antimatter-interview.htm). Fig. 1. 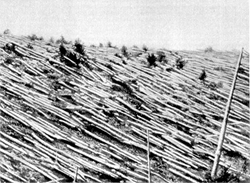 The devastation caused by the 1908 Tunguska explosion in Siberia over one hundred thousand acres. Organized interest on Einstein theories constitute a threat to the security of America because they dismiss the existence of antimatter asteroids without scientific process. Pamela Fleming. "Over a hundred years later," correctly states Jennifer Rosenberg in a post at hystory.com, "the Tunguska Event remains a mystery. However, if the blast was caused by a comet or meteor entering the Earth's atmosphere, it poses the serious possibility that in the future a similar meteor could once again enter Earth's atmosphere, but this time, land on a populated area. The result would be catastrophic. Researchers continue to study the area to find answers to their many questions" (http://history1900s.about.com/od/1900s/qt/Tunguska.htm). are converted to energy, thus explaining the release in the 1908 Tunguska explosion of energy equivalent to one thousand Hiroshima bombs. In the event America is hit by an antimatter asteroid even of the size of a small football, all our civilian, industrial and military communications will be disrupted for days because matter-antimatter annihilate into high energy photons that excite Earth's atmosphere, thus preventing any communication" (http://www.santilli-foundation.org/docs/Antimatter-2013.pdf). "Einstein's special and general relativities have no means whatsoever for the representation of antimatter because they were conceived decades prior to the discovery of antimatter in particle laboratories," states Pamela Fleming, Executive Vice President of the Institute for Basic Research. "For evident political alignment with Einstein's theories, academia has assumed for about one century that antimatter does not exist at the level of galaxies, thus implying that antimatter asteroids do not exist since they can only be generated by antimatter supernova. It is my opinion that this political posture by Einstein's followers in our academia is endangering the safety of the United States of America, as well as of the rest of the world. In fact, said political posture is responsible for the lack of serious studies in the Newtonian representation of neutral antimatter asteroids for about one century, with the exception of the representation achieved by Prof. R. M. Santilli and his group. Since there is no realistic hopes of corrections in our academia in the near future, it is hoped that the U. S. Military initiates research in the advance detection of antimatter asteroids by addressing at least some of the many open problems. For instance, as stressed by Prof. Santilli, we do not know whether light from our matter-Sun, or from our matter-lasers, is refracted or absorbed by a cold antimatter asteroid. Therefore, at the moment we do not know whether we can view antimatter asteroids with our telescopes, thus creating a real problem of national security fellow Americans should be aware of" (http://www.santilli-foundation.org/Detect-Ant-Galaxies.php?vsmaid=19). Fig.2. 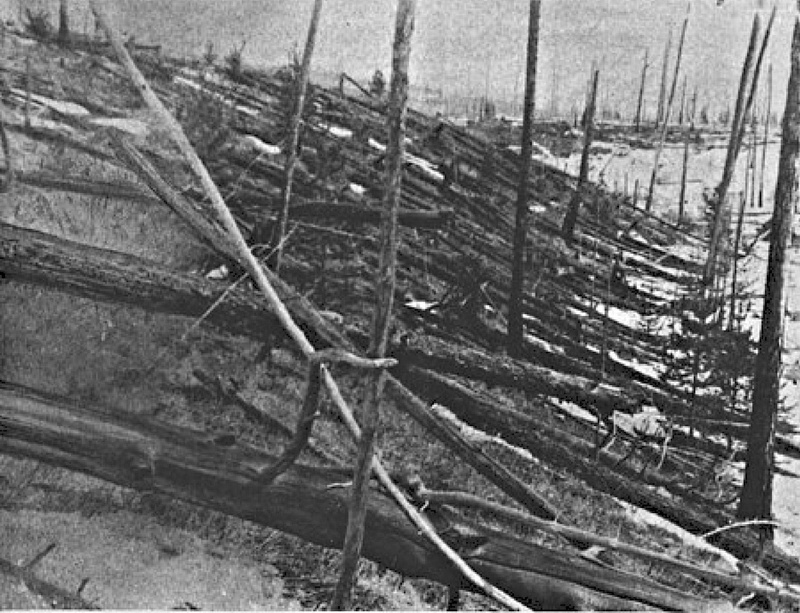 Another view of the devastation caused by the 1908 Tunguska explosion. Fig. 3. 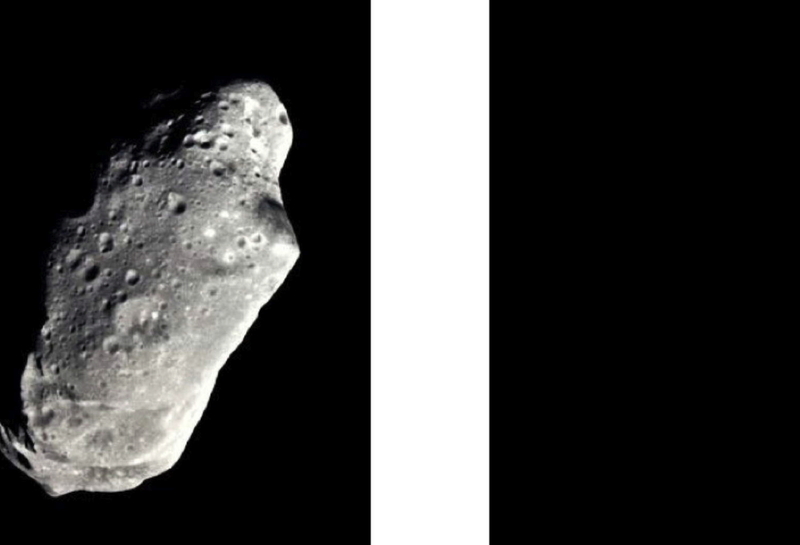 In the left, a matter-asteroid detected with Sun light and, in the right, a possible undetected antimatter-asteroids.